September 6th, 2009, I sent an email to 81 different electronic music event promoters and brains of this town. The gist was: Let’s all book something great for one week in February, hold panels and daytime events all over the city, and have ourselves a music festival … and let’s call it “Together.” After a tremendously positive response, we assembled a steering committee to help formulate what would become a city-wide super-event with hundreds of performers, discussions about art, music and collaborations like the city has never seen before. Much of it free. 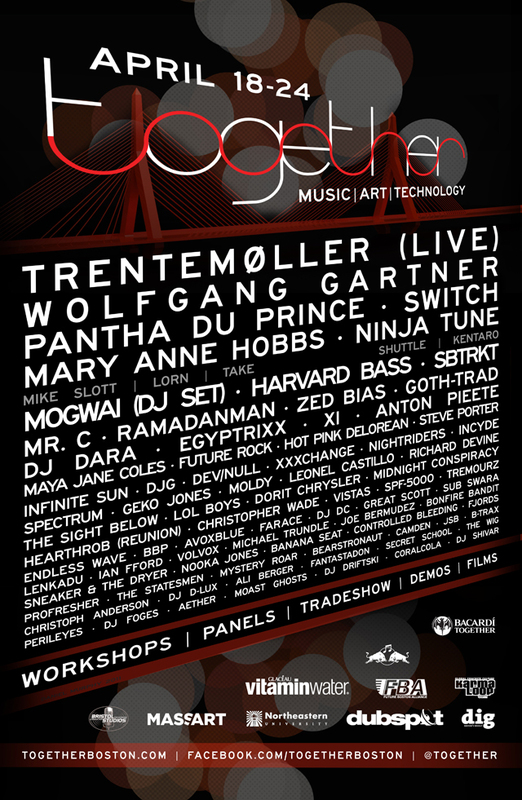 Together Festival 2011 is fresh, rising fast and we are excited to announce our participation in this very cool event. Starting April 20 the Dubspot family, alongside our San Francisco friends Surefire Sound, will be escaping our respective cities for a long weekend of workshops and events with producers such as Trentemøller, Ramadanman, Zed Bias, and Goth Trad, Toronto’s XI, and Dubspot’s high-powered stable of instructors. For a schedule of the entire event you can download the Weekly Dig’s Guide to Together 2011 for a full listing of events and parties. We’ll be starting our tour of beantown on Wednesday April 20 at the Good Life bar with the future bass sounds of Ramadanman (a.k.a. Pearson Sound) and Zed Bias (a.k.a. Maddslinky), supported by promising North American soundboys like Distal, DJG, and Frite Nite’s Moldy & Salva, as well as XI. Then on both Thursday and Friday, Dubspot will be inviting some of the previous night’s guests to Boston’s Bristol Studios for Dubspot’s Hi-Fidelity Sessions to show us what they’re doing behind the knobs. In attendance will be XI, Goth Trad, Steve Nalepa from L.A., and of course our own instructors. These sessions will be entirely free, open to all, and will last from 1PM-8M. After you hit Bristol Studios, Dubspot will be back at Good Life Friday night, where very special guest Richard Devine will be performing alongside Boston DJs and another performance from XI. Saturday, from noon-6PM Dubspot will be posted up at the Massachusetts College of Art and Design, where will have a booth setup demoing our various courses, and even a raffle for a chance to win a free Level 1 course in Abelton Live. To round out the weekend’s festivities, the Dubspot-sponsored Road Warrior Tour featuring Mary Anne Hobbs, Lorn, Gonjasufi, Take, and Strangeloop will be at Boston’s Paradise Rock Club starting at 7PM, putting a weighty end to an already heavy week of music activities. See additional details and event info below! The Dubspot Hi-Fidelity Sessions represent what Dubspot aspires to bring the public: unique and exciting ways for uniting the electronic music scene and educating the people within it. At each stop, a select group of world-class DJs, producers, sound designers, and musicians join top-notch Dubspot instructors to present production and performance strategies in an intimate workshop environment. We’re looking forward to sharing ideas, joining communities, and of course, having some fun Together. 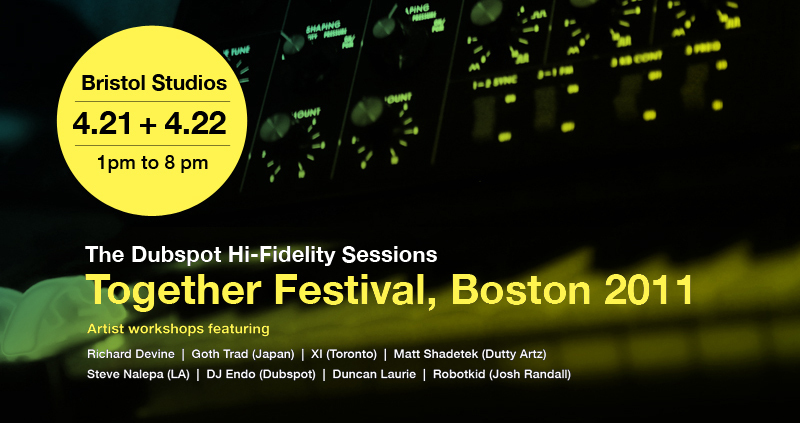 We’re elated to announce that special guest Richard Devine will be joining the Dubspot crew for our Hi-Fidelity sessions at the Together Festival. A true sound pioneer, Devine has released material on Warp and the Schematics imprint. Devine is also known for his prolific sound design work, contributing patches to popular Native Instruments plug-ins. Devine is also known for his extensive sample library, the Electronic Music Manuscript, made for Sony Creative Software.Artist workshops featuring Goth Trad (Japan), XI (Toronto), Steve Nalepa (LA), Duncan Laurie + Ableton, Native Instruments, Propellerheads and Dubspot Instructors. More details to come.